RIJASOLO | MAHATSINJO - Exorcism session on a 13-year-old girl at Toby Karmela. A "toby" (which can be translated as "camp") is a kind of dispensary run by "Mpiandry" (healer-exorcist) and which welcomes all sick people in need of care. I note that the majority of patients suffer from psychological disorders (depression, dementia, neurosis, psychosis, etc.). But here they are considered possessed by the devil or an evil spirit. 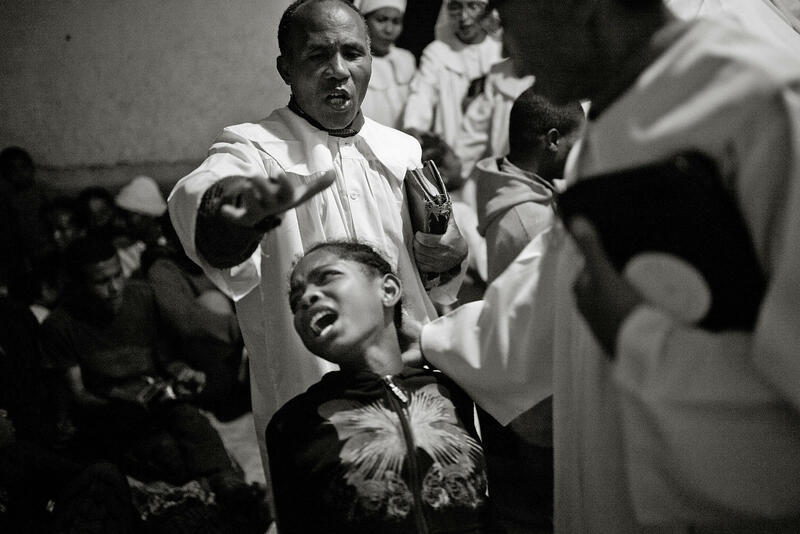 Two or three times a week, at nightfall, the mpiandry of the Karmela toby gather the patients in the prayer room and, in the light of a small bulb, they proceed to a collective exorcism session. The patients pass in turn in front of a mpiandry, who pronounce incantations and prayers, a bible in his hand, to cast out evil eye, evil spirits, demons, or simply to psychologically prepare a fragile person not to be invaded by evil spirits. These sessions last between two and three hours. The mpiandry focus a lot on certain people, like this 13 year old girl, considered as affected by a particularly "tough" demon. They are two mpiandry "working" on her for over an hour. The strident screams of the young girl, in a state of insanity and at the end of nerve, mix with the aggressive psalmodies of the mpiandry plunging the rest of the audience into a form of collective trans. 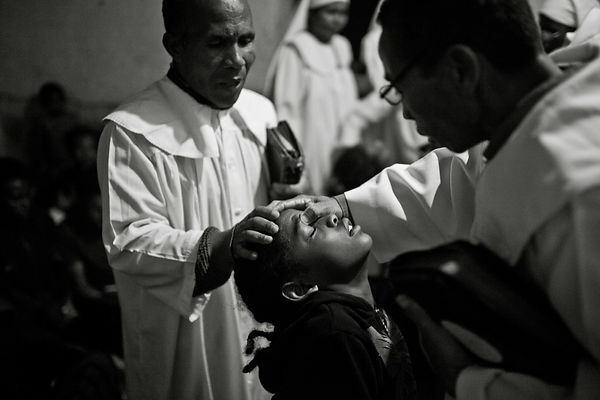 MAHATSINJO - Exorcism session on a 13-year-old girl at Toby Karmela. A "toby" (which can be translated as "camp") is a kind of dispensary run by "Mpiandry" (healer-exorcist) and which welcomes all sick people in need of care. I note that the majority of patients suffer from psychological disorders (depression, dementia, neurosis, psychosis, etc.). But here they are considered possessed by the devil or an evil spirit. 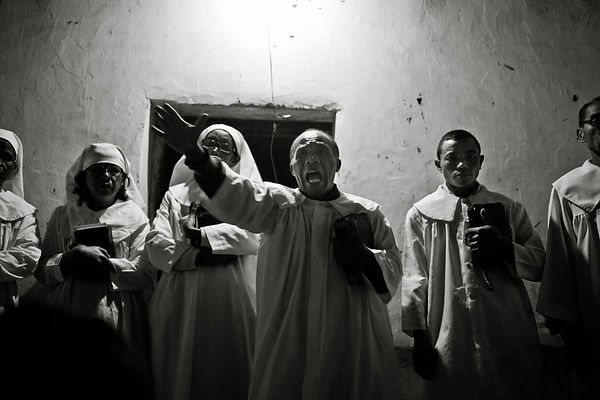 Two or three times a week, at nightfall, the mpiandry of the Karmela toby gather the patients in the prayer room and, in the light of a small bulb, they proceed to a collective exorcism session. The patients pass in turn in front of a mpiandry, who pronounce incantations and prayers, a bible in his hand, to cast out evil eye, evil spirits, demons, or simply to psychologically prepare a fragile person not to be invaded by evil spirits. These sessions last between two and three hours. The mpiandry focus a lot on certain people, like this 13 year old girl, considered as affected by a particularly "tough" demon. They are two mpiandry "working" on her for over an hour. The strident screams of the young girl, in a state of insanity and at the end of nerve, mix with the aggressive psalmodies of the mpiandry plunging the rest of the audience into a form of collective trans.